So its a tradish in our family to go out with all the women once another in the fam joins the ranks of "woman" ;) We happened to be in Corpus during this special event for Aubrey;) and were able to have dinner with my mom, sis, grandma, cousins, mother in law, sis in law and Joey's aunt too. (I'm just blogging about this a bit late) We hadn't been able to do this in years! It was super fun to be with everyone celebrating our little girl growing up! And though this subject is "taboo" or whatev, I'm blogging about it anyways. Its life y'all. Get over it :) I can't believe how old Aubrey is already. She is growing into such a beautiful young lady. I seriously couldn't be more proud of her!!! 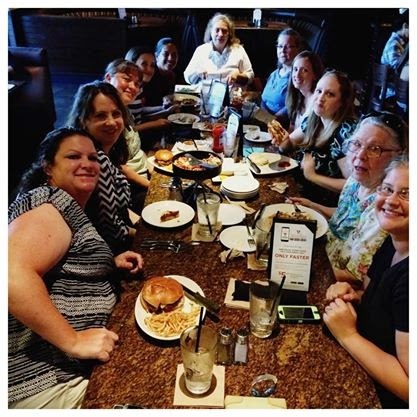 Here we are at BJ's restaurant. And you can't tell but I'm soaking wet from a drink the waiter had spilled on me. Ice cold water. Full glass. And thanks to my sis, I got my meal for free. And Aubrey's. I deserved it darnit. That was freakin cold. When we got home from our trip, I also made good on my promise to take her to the Cheesecake Factory and let her order anything she wanted. Thats what I had been telling her to make the experience less awful so she was actually looking forward to it:) I tricked her, hahaha. 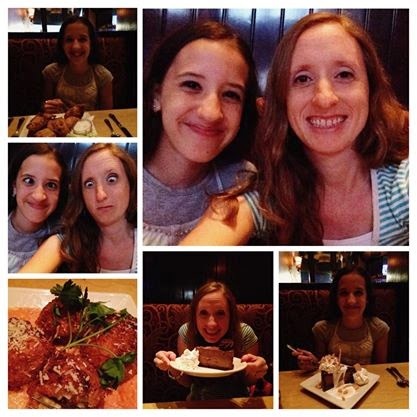 It was a fun mommy daughter date! I think its important to make this fun! And to always have an open comfortable conversation with my daughters about this kind of stuff. I'm glad that my girls so far talk to me about anything and everything. Not awkward. And thats my goal. I want them to be able to come to be about anything, any problem, any issue, any fear, concern, etc. I want to be there for them!